Maximum size: 6.4 mm (extrapolated from shell length). Identification: This species has a glossy, transparent shell with faint spiral striae. It is marked by two broad, irregular bands of opaque white. It differs from the shell of Acteocina sandwicensis in having a deeper suture and a broader aperture with the outer lip arching far forward apically. 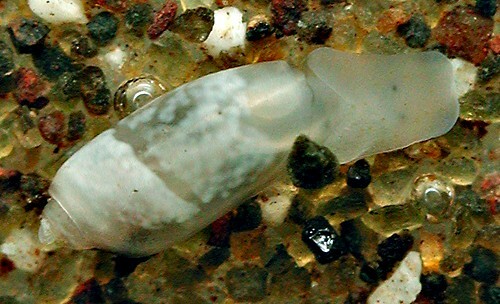 The animal is translucent cream with faint brown spots. Natural history: Acteocina sp. #2 is a moderately rare burrowing species found at depths of 6 m (20 ft) to at least 9 m (30 ft) at moderately exposed sites. All or most live animals have been found in sand samples taken near the edges of sand patches or channels. Distribution: Maui, Oahu and French Frigate Shoals. May also be known from the Philippines. Taxonomic notes: It's also listed as Acteocina sp. 2 in Severns, 2011. It was first recorded in Hawaii from Five Graves, Makena, Maui by CP on Nov. 21, 1995. Photo: CP: 3.6 mm: 2006 CREEF expedition; off Keehi Lagoon; Oahu; Oct. 7, 2006.